Cody Ross is one of a few key free agents the Giants are losing after the end of the 2011 season (which could come tonight if the Rangers win in St. Louis). Well, maybe losing is the wrong word, especially in Ross' case, since he pretty clearly wants to return to the Giants in 2012. How do we know? He said so himself. "I have talked to them briefly, but no negotiations have taken place," Ross wrote in an email to Hank Schulman of the San Francisco Chronicle. "They have interest and so do I. Hopefully we can get something done." 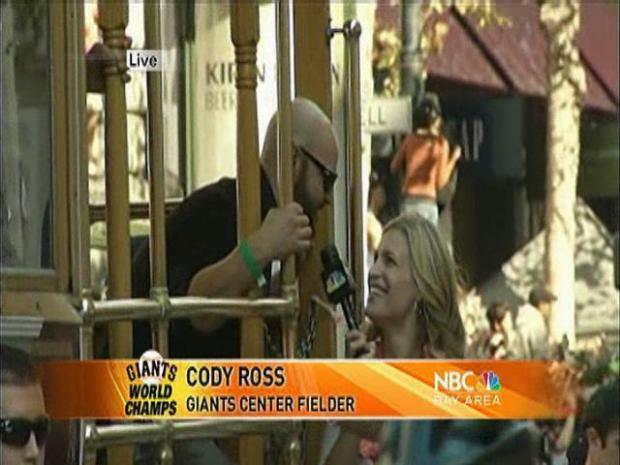 Giants outfielder Cody Ross is the breakout star of the postseason. Now, there's one big problem. And it's the same problem that teams usually run into: money, natch. Ross made $5.3 million in 2011 but didn't really provide a substantial return on the investment, playing 121 games and hitting 14 home runs and knocking in 52 RBI while producing a .240/.325/.405 line. On the Giants, that was actually a pretty good line, as Ross was second on the team in home runs, third in RBI, fourth in batting average, third in slugging percentage and third in on-base percentage (the latter three for those that qualify). The World Champion San Francisco Giants get a ticker-tape parade down Market Street. But that's indicative of just how terrible the Giants offense was this year, not Ross being a monster. And yes, that means it's really two problems, since the Giants focus this off-season has to be improving the offense. And as Schulman notes, the Giants would likely be amendable to bringing Ross back, if he'll take a pay cut. That's mainly because if Ross won't take a pay cut, the Giants will struggle again to fill the lineup with guys that qualify as above-average hitters. And given how 2011 ended, that's just not acceptable.